READ: Donald Trump's Personal Charity Tax Filing Shows Very Minimal Support For Veterans; Biggest Chunk To "Citizens United Foundation"
Trump is touting his debate-skipping-fundraising-for-veterans event tonight, and suggesting that people support military veterans by donating to his personal charitable foundation. Besides the fact that Trump does NOT - directly, at least - contribute to the foundation, there is the problem that its most recent tax filing shows little or no grants to veterans' organizations. It shows that nearly half-a-million dollars was contributed to the Donald J. Trump Foundation, Inc. - $477,400 from Richard Ebers Inside Sports and Entertainment Group, and $20,000 from Prestige Mills. Now, one or both of those may have contributed at the direction of Trump and it may be a portion of his earnings from one or both of them. But, there are no contributions directly attributable to Trump in either 2014 or 2013. So, from a Presidential candidate who is worth billions of dollars, Trump has contributed approximately $10,000. (No such contributions were made in 2013.) Ten times that amount went to the namesake founders of the anonymous money in politics movement. Thanks to CitizensAudit for making the public filings from the IRS available on the internet. Arizona Governor Doug Ducey (R-AZ) today announced "a partnership" with two members of Arizona's Congressional delegation to begin a new push to separate Arizona from the U.S. 9th Circuit Court of Appeals. Further, he would like to see it attached to "any must-pass legislation" coming up this year. The first "fact" that he states in his October letter to the Speaker of the House and the Senate Majority Leader - dated the day after Paul Ryan became Speaker - is that "(t)he 9th Circuit is currently the most overturned court, having a 77% reversal rate." In his press release, he states it is "by far the most overturned". Arizona's Politics reviewed the Supreme Court's decisions on affirming or reversing the 13 circuits (and state courts) for the past five years. (This was only possible because of the "stat packs" provided by the wonderful, authoritative source on all things Supreme Court-related, SCOTUSblog.) Between 2010 and 2015, the U.S. Supreme Court reversed 71% of ALL federal cases it decided; not surprisingly, 6 of the 13 Circuits were reversed more than the average. And, three of the Circuits have HIGHER reversal rates than the 9th Circuit. (Hello, 8th, 6th and 11th.) MUCH higher reversal rates - 87%, 86% and 86%. (It is unlikely that anyone even describes those circuits as more liberal than the 9th.) Even more startling, the 9th Circuit had the 3rd LOWEST reversal rate (63%) this past term - better than the neighboring 10th Circuit that the Governor would like to see Arizona move to. Due to its geographic size - nine states and two possessions - the Ninth Circuit produces a voluminous docket resulting in delayed case resolution and inconsistent results. It is presently estimated that the court has 14,076 pending cases with a disposition time of 15 months. This is nearly three times as many as the next largest circuit's caseload. The most recent statistics were published this past year for cases as of June 30, 2015. (Re-published below) It also shows the past several years' statistics and ranks the circuits, for comparative purposes. It shows 13,760 pending appeals with a disposition time of 12.8 months. Those numbers have both shrunk over the past five years. Of course, it is correct that the 9th Circuit has many more pending appeals than the next largest circuit (the 11th); however, when factoring in that the 9th also has twice as many panels of judges than the 11th, you find that the pending appeals PER panel is only 57% higher (much less than "three times as many") - 1,423 vs. 905. More misleading is linking "the geographic size" to being "by far...the most overburdened." As a minor point, the geographic size is not what makes the 9th Circuit the busiest - it is the population (individual and business) that is more determinative of caseload. But, the logical measure of "overburdened" is the disposition time, and not the size or the number of cases. The 9th Circuit's disposition time is 0.1 month longer than the 1st Circuit and 1.2 months shorter than the D.C. Circuit (which does have a significantly different type of caseload). The numbers show that the 9th Circuit's (shortening) disposition time is poorer than its peers, but certainly not "by far". CONCLUSION: The Governor and Republican lawmakers certainly can make their case that Arizona would be better served in either the 10th Circuit or by splitting the 9th Circuit in two. However, to falsely build that case on incorrect statistics and to overstate erroneous conclusions is wrong and misleading. The evidence warrants a reversal of Governor Ducey's claims. A final interesting note: The Governor's letter came a couple of months after the Supreme Court AFFIRMED the 9th Circuit on the (1st) Arizona redistricting challenge and one year after it basically affirmed 9th Circuit on the follow-up SB1070 case (by not accepting certiorari). * In 2013, the Supreme Court also AFFIRMED the 9th Circuit in ruling against Arizona regarding its voter registration forms. The Supreme Court did REVERSE the 9th Circuit last year in the Gilbert sign code case. * The important Arizona case regarding the SB1070 anti-illegal immigration law partly affirmed and partly reversed the 9th Circuit decision. SCOTUSblog tells Arizona's Politics that they make a case-by-case determination in such cases as to which is "the more significant part of the ruling". WATCH: Sheriff Arpaio Endorsing Donald Trump: "A Great Patriot"
Maricopa County Sheriff Joe Arpaio took a quick trip to Iowa today to endorse Donald Trump for President. He was the celebrity politician endorser-of-the-week, following Sarah Palin's speech last week. "It's just easy to endorse him," Arpaio said, "because everything I believe in, he's doing and he's going to do it when he becomes President." Trump praised Arpaio as "This is a man who believes in borders....He's tough, he's strong and he's smart." Trump noted that Arpaio had offered him an endorsement some time ago, but that the campaign held on to it for the right moment. In answer to the first press question, Trump noted that he made "no deals" with either Arpaio or Palin. In the wake of Desert Vista HS's incident last week regarding six young women displaying the word "Ni**er" on their t-shirts, neighboring Mt. Pointe HS gets phone call (after hours) "perceived as a threat". Evacuated. Both schools are in the Ahwatukee portion of Phoenix but are in the Tempe Union High School District. Late this afternoon, after students had already been released, and the majority of staff were gone, our receptionist received a phone call that she perceived as a threat. While the threat was not specific, we were precautionary by alerting the Phoenix Police Department and District Administration. We were advised to evacuate the building for any remaining staff or students so police can conduct a safety check. The safety and well-being of our students, staff and community are always first and foremost. We will continue to work with the police as they guide us in through this situation. As appropriate, I will share additional information with the Mountain Pointe community as it becomes available. Because we periodically report on and/or discuss Middle East issues (Israel/Palestinians, Syria, ISIL, Lebanon) - and our Congressional delegation frequently does - we are re-posting the email we just received from the State Department, with the remarks from U.S'. Representative to the U.N., Samantha Power. You are subscribed to U.S. Mission to the UN for U.S. Department of State. This information has recently been updated, and is now available. Thank you, Foreign Minister Nin Novoa, for chairing this meeting, and for Uruguay’s leadership in its first presidency on the Council. I also thank the Secretary-General for his briefing to the Council today and his being here, which is testament to the serious challenges facing the region – a reality underscored by his appropriately bleak briefing. My remarks today will focus on three parts of the region: the Israeli-Palestinian issue, Syria, and Lebanon. On the Israeli-Palestinian issue, we remain very concerned about the impact that terrorism and ongoing violence have on Israelis and Palestinians and by the lack of progress toward a two-state solution. The United States strongly condemns terrorist attacks perpetrated by Palestinians. These include the attack on 24-year-old Shlomit Krigman, who was stabbed yesterday outside a supermarket and died earlier this morning; another woman, age 58, was also stabbed and wounded in the attack. They also include Dafna Meir, a mother of six children, who was stabbed to death in her home on January 17th while trying to defend her kids, as we heard earlier. These and other reprehensible and inexcusable attacks against innocent civilians underscore the critical importance of affirmative steps to stop incitement, restore calm, reduce tensions, and bring an end to the violence on both sides. We also condemn Israeli settler violence against Palestinians and their property in the West Bank, such as the appalling 2015 attack that killed three members of the Dawabsheh family in Duma – father Sa’ad, mother Reham, and their 18-month-old boy, Ali Sa’ad – and badly burned their other four-year-old son. There is absolutely no justification for any of these acts of terrorism. We all must condemn them – consistently and unequivocally. The United States continues to stress the need for fair judicial processes for all, to bring to justice all perpetrators of violence and acts of terrorism. The recent indictments brought by the Israeli government against the terrorists who perpetrated the Duma attack represent a positive step, but more must be done to ensure that those responsible for such attacks are held accountable. It is also incumbent on the Palestinian Authority to do all it can to counter incitement to violence and to continue to press for calm. In addition, in dealings with civilians and peaceful protests on both sides, it is critical that every possible effort be taken to show restraint, guard against the loss of life, and de-escalate tensions. The United States strongly opposes settlement activity, including some steps Israel has taken this month. We are deeply concerned about reports of a declaration of more than 370 acres in the Jordan Valley in the West Bank as state land. We are also deeply concerned about recent steps that appear to have effectively created a new settlement south of Gush Etzion. Some 70 percent of the West Bank’s Area C has already been unilaterally designated as Israeli state land, or as being within the boundaries of Israeli regional settlement councils. Steps aimed at advancing the Israeli settlement project – including changing the designation of land, issuing building tenders, and constructing new settlements – are fundamentally incompatible with the two-state solution and raise legitimate questions about Israel’s long-term intentions. That concern notwithstanding, let me make crystal clear – as has Secretary Kerry and other U.S. government officials on multiple occasions – that settlement activity can never itself be an excuse for violence – never. The United States is also following with concern the demolitions and evictions that have been undertaken by Israeli authorities in several locations throughout the West Bank and East Jerusalem. On January 21st, 16 people – six of them children – were displaced when Israeli authorities demolished four homes in Jabal al Baba, a village which lies within the area known as “E1.” These actions reflect an ongoing trend of demolition, displacement, and land confiscation that continues to undermine prospects for a two-state solution. Also alarming are the grave humanitarian conditions in the Gaza Strip, where Gazans face extraordinary challenges in their daily lives. This month, UNRWA launched a $403 million appeal to meet urgent humanitarian needs in the West Bank and Gaza, such as emergency food and medical aid, and we all must do our part to make sure these needs are met. We urge all Member States concerned about the conditions in which Palestinians live to join the United States in contributing to UNRWA’s appeal and assisting those in need. As we have repeatedly made clear, we continue to look to both sides to demonstrate with actions and policies a genuine commitment to a two-state solution. To that end, Quartet Envoys traveled to the region last month to meet with Israeli and Palestinian leadership to explore ways to preserve a two-state solution, and the Envoys will meet again early next month in Europe. We also encourage the parties to take steps to address the issues underlying these challenges, such as opening Gaza border crossing points, streamlining the civilian workforce, addressing infrastructure needs, and promoting broader economic recovery. Preventing the supply of illicit arms to Gaza is crucial, as is supporting a process that results in the Palestinian Authority’s effective control of Gaza. We understand the enormous political challenges involved in grappling with these tough issues on both sides, particularly in a climate of increased security threats, terrorism, and distrust. But as we have seen, the passage of time will only make these tough issues harder, not easier, to resolve, and we encourage leaders to take steps that will preserve the possibility of two states and further prospects for peace. On Syria, we continue to be horrified by the immeasurable human suffering caused by the country’s brutal conflict. We’ve spoken repeatedly here and elsewhere about the atrocities and inhumane conditions that the Syrian people have been forced to endure, all of them man-made. And yet the situation just keeps getting worse. According to the Secretary-General’s most recent report, an estimated 13.5 million people are now in need of humanitarian assistance in Syria, 1.3 million people more than in 2014. Six million of those in need are children, nearly a million more than a year ago. Six million children. As a Council, these numbers beg the question: With all that we know about the dire situation of the Syrian people, and with all of the resolutions we’ve adopted in this chamber aimed at addressing this humanitarian catastrophe – how can it be that these numbers just continue to rise? The conditions are particularly abysmal in besieged areas, where, according to the UN, nearly 400,000 people are waging a daily struggle to merely survive. The Secretary-General’s report describes UN access to these areas as “pitiful;” less than one percent of civilians in besieged areas received food aid per month in 2015, and only three percent received health assistance. We’ve all seen the ghastly consequences of these sieges in reports on the 40,000 people trapped in Madaya. An anesthesia technician who works in Madaya’s medical clinic – a clinic that had to be moved to a basement after the aboveground facility was bombed – told a reporter that he had started to give the most malnourished children syrupy medicines, for the sugar so that the kids could have some sugar. Parents told aid workers that they were giving their children sleeping pills, so that they would be spared being kept awake by hunger pains. If you have not seen the haunting photos of these children, you must force yourself to look at them and see the anguish being inflicted on the most vulnerable among us. We have a collective responsibility to hear their pleas. Yet while the suffering in besieged areas has been vehemently condemned around the world, the parties to the conflict just continue to block humanitarian aid from reaching those in need, and here I stress particularly the Syrian regime. According to the Secretary-General’s report, of the 15 besieged areas, two of them are besieged by armed opposition groups, one by ISIL, and 12 of the 15 by the Assad regime – a regime that sits here, at the United Nations, as a Member State. Out of a total of 113 interagency convoy requests that the UN sent, this UN Member State approved and completed only 13. That’s 13 out of 113 approved and completed – that means 100 out of 113 dire requests last year were not completed. And with 80 of the requests, the Assad regime – a UN Member State, again – did not even bother to respond to the United Nations within three months. This is not an isolated practice – applied in one place for a limited period of time – it is part of a deliberate, systematic strategy aimed at killing and displacing civilians. Now it is true that a handful of convoys carrying food and medical assistance have been able to reach Madaya over the last few weeks, and we commend the brave staff of the UN and international humanitarian groups and local actors who have pressed relentlessly for the delivery of life-saving aid. However, it would be a grave mistake to think that starving people in besieged areas will now survive – much, much more aid is needed. And fewer than two dozen people in serious need of medical treatment – who the UN has told us will die if they don’t get out – only a subset of the 400 identified have been evacuated from Madaya, and specialized medical and nutrition teams have been denied reentry, having paid brief visits before. The February 4th conference in London – where the U.S. delegation will be led by Secretary Kerry – provides an opportunity for the international community to fill the growing gaps in the UN’s funding humanitarian appeals for Syria, and we urge all Member States to put forward robust pledges aligned with the rising needs of the Syrian people. But the mobilization of funds has to be accompanied by a much more aggressive mobilization of political pressure on those who are cruelly blocking aid from reaching desperate civilians and families. We also must not forget that starving people to death is far from the only form of suffering the parties are inflicting on civilians. The Syrian regime continues to drop barrel bombs on civilian areas – which reportedly killed at least 12 children in December, and maimed many more. And the Syrian regime continues to carry out air strikes like the one that hit a crowded market in Jisreen on December 4th, killing some 26 civilians. The regime does not act alone, as we know. It has the help of powerful supporters, including Russia. Credible monitoring organizations have documented the effects of Russia’s airstrikes in Syria, which continue to target opposition groups and have killed many hundreds of people – the vast majority of them in non-ISIL-controlled areas and with no connection to ISIL whatsoever. In Deir az Zour, not only has ISIL besieged the city, but the group also has reportedly executed and abducted hundreds of civilians. The Secretary-General’s report described one video released by ISIL in December which showed six civilians being executed after being accused of collaborating with the Syrian regime. The UN reported that the executioners appear to be children under the age of 15. All of this suffering and barbarity underscores the urgency of working toward a political solution. And to that end, we welcome Staffan de Mistura’s issuing invitations today for the talks to begin this coming Friday in Geneva. The initiation of UN-facilitated Syrian negotiations to reach a political transition, in accordance with the Geneva Communique, is a critical step toward ending the conflict in Syria. We are encouraged that the High Negotiations Committee assembled a broad representation of the Syrian opposition, and has demonstrated a genuine commitment to participating in this political process. Finally, let me turn very briefly to Lebanon. This Council has stressed repeatedly that the Lebanese people deserve – and indeed require – a fully-functioning government to safeguard Lebanon from the threat of ISIL and other terrorist groups, as well as to address the country’s significant economic challenges – including those accruing by virtue of them hosting more than one million Syrian refugees, giving Lebanon the highest per capita refugee concentration in the entire world. As Lebanese discussions over the presidency continue, we support adherence to the constitutional process to elect a president, not any one candidate. It is critical that Lebanon’s leaders respect the government’s policy of disassociation from regional conflicts, first enshrined in the June 2012 Baabda Declaration. As this Council has emphasized for years, Lebanon should focus on strengthening its institutions, resolving difficult internal disputes, and building up the rule of law – and not become involved in Syria’s civil war. Former Phoenix Mayor Paul Johnson, now an independent. Former Phoenix Mayor and Arizona Attorney General Terry Goddard, a Democrat. Republican consultant Chuck Coughlin. The three of them have done political battle against each other many times over the years. Throw in at least $1M from a Texas philanthropist/election reform advocate, and an independent voters' group, and you have quite a coalition. The coalition came together today in central Phoenix to announce their effort to put two separate initiatives to amend the Arizona Constitution and to fundamentally change Arizona election law. Open & Honest Elections will need at least 225,963 valid signatures on the initiative to open primaries up to put independent candidates on more equal footing with those from the major parties, and on the initiative to require disclosure of the original source of funding for campaign contributions of more than $10,000. When Johnson talked about the difference between this new effort and the open primaries initiative that was soundly defeated in 2012, he cited this broad-based coalition and team of rivals. When he started to talk about the long view and said it may not get a majority of votes this time, either, Coughlin immediately jumped in and flatly stated "we WILL win." The national Open Primaries group, primarily funded by Texas philanthropist John Arnold, has made a $1M contribution to the Arizona joint effort, with hopes to raise $13M more. They promised that they will "over-disclose" who contributes to the effort, even though current laws do not require it, and pointed out that the opponents to the measure will not be disclosing. SIDENOTE: The Open & Honest Elections group and Goddard cite Arizona's Politics' $15M+ figure of dark money in Arizona in 2014 elections. Here is that article, from shortly before the November election day. Much of the methodology and definitions used is included in that article. (More detail is available in our series of #50ShadesOfDarkMoney articles.) As expressed to other reporters, more detail is available upon request. In addition to denying Sheriff Joe's immigration-related petition today, the U.S. Supreme Court ended Andre Leteve's appeals of his Arizona death sentences for murdering his two young sons in Scottsdale six year ago. The Court refused his petition for relief after the Arizona Supreme Court affirmed the death sentence in August. Leteve purchased a handgun, killed his 5- and 1-year old children with it and shot himself in the face after separating from his wife. Here is how the Arizona Supreme Court summarized the case. Leteve had appealed the two death sentences (one for each son) on a large number of reasons. The Arizona justices addressed the top several; the U.S. Supreme Court justices declined to address any of them. Leteve will remain on Arizona's death row. Leteve's case attracted worldwide attention for the heinousness and depravity of the actions. Sheriff Arpaio: What a Tease! "I've Just Made a Very Tough Decision!" I get a lot of emails from Maricopa County Sheriff Joe Arpaio, asking for money in not a lot of ways. So, I was NOT alarmed by the subject line of today's missive: ""I've Just Made a Very Tough Decision!" In fact, I knew he was not going to send an email to his vast fundraising lists announcing that he was withdrawing his candidacy for re-election due to his wife's battle with cancer. And, I knew that his fundraising plea guru, Chad Willems, would seize upon the news stories with an email subject line that would prompt fans to open the ask as quick as their mouse could click. I have made a major decision, and it was a very tough one, but I knew you deserved to be the first to know. After hours of prayer, and countless frank discussions with my wife Ava and other trusted advisors, I have decided my time as Sheriff is over, unless I can count on you to stand with me this election. So , I have to ask you – do I have your support? The reason I need to know if you are still with me is because this is going to be the toughest election I have ever faced. Pollsters and pundits all agree that my hard-line stance against illegal immigration, my outspoken support of 2nd amendment rights, and my unflinching toughness on criminals has made me a target of special interest groups and left-wing politicians across the nation. Left-wing elites are counting on the crowded Presidential election to distract my loyal supporters from my race so they can finally replace me with a sheriff who fits into their agenda. But I know that if I still have your support, we can defeat those who are hoping to replace me with someone willing to look the other way when it comes to the laws of our land. Do I still have your support? I've already seen my opponents crossing lines I never thought they would in hopes to tear me down, and as we come closer to the election they are pulling out all the stops to unseat me. From entirely unfounded charges of racism in my office, to public attacks by Hollywood celebrities, and countless lawsuits rolled out by the Obama Justice Department, the leftist establishment and media will stop at nothing to bring me down. My advisors tell me that this re-election battle is only worth it if I can count on your support, and as of right now, I am not sure if I still have it. That is why I'm asking you to take this immediate opportunity – CLICK HERE – and let me know if you are still with me by signing your personalized "I STAND WITH JOE" re-election support pledge immediately. Moreover, going up against Barack Obama's political machine, Hollywood leftists, and the local and national media is extremely expensive. Since we are still fighting the multiple unfounded lawsuits that have been rolled out by the Obama Justice Department, the leftist establishment knows my financial resources are drained – and they are going to capitalize on it. That's why I also need your financial support, . After you take the "I STAND WITH JOE" re-election pledge, please make a generous contribution of whatever you can afford. For some of you $5 is all you can spare today. But for others $500 or even $1,000 is a sacrificial gift you are willing to make. My team has told me that because our reserves are almost completely drained I will need to raise at least 5 million dollars to have a fighting chance, so every single dollar helps. Whether its $5, $50 or even $500 . . . I solemnly pledge to you that I will faithfully use your contribution to win re-election so I can continue to enforce the laws of this great country as I always have. I hope I can count on you to stand with me and show your support today. FEC filings show that most or all of GOP Presidential candidate Ted Cruz’s improperly-disclosed $545,000 personal loan in 2012 has effectively made its way into his his Presidential campaign via two different paths. The transactions arguably violated federal law in several different ways. The New York Times reported late this afternoon that Cruz and his wife, Heidi, had received the 2012 loan from Ms. Cruz’s employer, Goldman Sachs. The now-Senator’s Personal Financial Disclosure statements (2014 here, below) filed with the Senate show that the loan was actually made by the Cruzes to the campaign, using their credit line from Goldman Sachs. 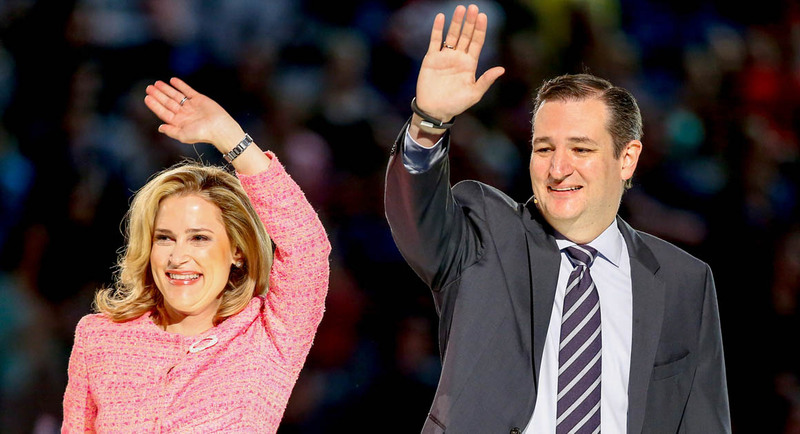 The Cruzes lent the 2012 Senate campaign committee a total of $1.43M, repaying $885, 000 over the following two years. However, rather than having his Senate campaign repay the Cruzes after the Senate campaign committee was flush with cash, the committee CONVERTED the loan this past year into a $545,000 contribution from the Cruzes to the committee. That same day (March 31, 2015), the Ted Cruz For Senate committee TRANSFERRED $250,012 to the Cruz For President committee. In fact, the Cruz Texas Senate committee served the role as a sort of shadow presidential campaign during most of 2015, picking up the tabfor airlines, charters, Iowa hotel rooms, etc. for Cruz. On July 8, Cruz told the Federal Election Commission that he was permitted to run simultaneously for both the Presidency in 2016 and for Senate in 2018; therefore, he was permitted to solicit and retain contributions for the 2018 general election campaign. Six weeks later, on August 19, he notified the FEC that he was “has temporarily suspended” his 2018 Senate run. 1) Was initial loan improperly disclosed to the FEC? The thesis of the NYT article is that the loan reported to the FEC should have disclosed that the funds came from Goldman Sachs. Cruz and his campaign has acknowledged that that should have been disclosed, and that it was "inadvertent". It was almost an understandable error that it was not disclosed, because the Cruzes may have believed that they were, in effect, turning some of their investments in the GS account into cash. 2) Was the loan an improperly-large contribution from Heidi Cruz? We now know the loan was at least $545,000. Ted Cruz is able to lend and/or contribute an unlimited amount of his own monies to the campaign. However, his spouse is not. (11 C.F.R. §110.1(i)) Assuming that the Cruz assets were jointly-held (their was no designation in Cruz's 2012 financial disclosure), the total assets needed to be greater than $1,090,000 for there to be even an argument; it was not - using the high end of each disclosed range, the assets were worth no more than $745,000. Additionally, federal election law (11 C.F.R. §§100.83 and 100.33) would seem to indicate that Ms. Cruz is deemed to have contributed half of the loan. This violates the contribution limits. 3) Was the transfer from Cruz's Senate campaign committee to the Presidential campaign committee improper? The March 31, 2015 transfer from the Senate committee to the Presidential committee was in clear violation of federal election law, and the Cruz campaign sealed the violation by their filings. Cruz was actively seeking nominations for both the Senate and the Presidency beetween March 23, 2015 to August 19, 2015; In July, the campaign formally told the FEC that he was running for both because Texas law permits him to do so. Regulations (11 C.F.R. 110.8) PROHIBIT the transfer of funds between the two campaigns: "No funds, goods, or services, including loans and loan guarantees, may be transferred between or used by the separate campaigns, except as provided in 11 CFR 110.3(c)(5)." 110.3(c )(5) does not provide Cruz an exclusion; rather, it also indicates that the transfer must not permit contributors to double max-out. 4) Was the use of Cruz's Senate campaign committee funds for expenditures that were obviously related solely to the Presidential campaign improper? Funds contributed to a campaign committee are to be used in the campaign for that office. (52 U.S.C. §30114(a)) An argument could be made that building support among Republicans nationally (especially in non-adjacent Iowa) could benefit the Cruz Senate re-election committee, but it would be hard to keep a straight face. It could also be seen as a way of avoiding the prohibited transfer (see, above) to the Presidential committee. Tempe attorney Paul Weich reported this article. THIS AFTERNOON: Will Arizona Sky Be Next $60,000 Canvas For Anti-Trump Message By Alabama Millionaire? People in the West Valley might look to the sky this afternoon for their next Presidential election ad. Millionaire real estate developer Stan Pate from Alabama hammered the billionaire former real estate developer-turned-GOP-Presidential-frontrunner Donald Trump over the Rose Parade on January 1; today's national championship football game between Alabama and Clemson (from key early primary state South Carolina) might be the next $60,000 canvas. $59,610 skywriting on January 1 that stated: "America Is Great. Trump Is Disgusting. Anybody But Trump." The independent expenditure was by "We The People Foundation", which filed their disclosure (incorrectly in several ways, but filed) with the Federal Election Commission. (embedded below) News articles credit Pate. Pate promised more, and he and We The People declined to answer Arizona's Politics' repeated requests about whether there are Arizona plans. Given that Pate hired skywriters at a previous Alabama national championship game (2010) and that South Carolina (home of Clemson) is a key early primary state, it will not be surprising if a synchronized squadron of planes puffs out a similar anti-Trump message. Look! Up in the sky! It's a message! It's a strange hair piece! It's...anti-Trump! READ: Obama Executive Actions Regarding Guns; New ATF Guidance: "Do I Need A License To Buy and Sell Firearms"
Part of Arizona's Politics' central mission has always been to provide context to the political debate. We frequently clip and provide speeches by Arizona's elected officials, as well as the texts of decisions, bills, laws, etc. The legal memoranda behind the Obama Administration executive actions related to the immigration issue last year were not easily accessible at first, but we hunted until we could post a copy. Of course, the President's remarks had a distinctly Arizona element to them, as he singled out the mass shooting in Tucson five years ago which included an attempted assassination of then-Rep. Gabrielle Giffords; six people were killed and 13 injured. Here are the remarks.